Cyclosorus exsculptus (Baker) S.Linds., Edinburgh J. Bot. 66: 359. 2009. – Acrostichum exsculptum Baker, J. Bot. 26: 326. 1888. – Leptochilus exscultus (Baker) C.Chr., Ind. Fil. 9, 385. 1905. – Dryopteris exsculpta (Baker) Copel., Philipp. J. Sci. 37: 410. 1928. 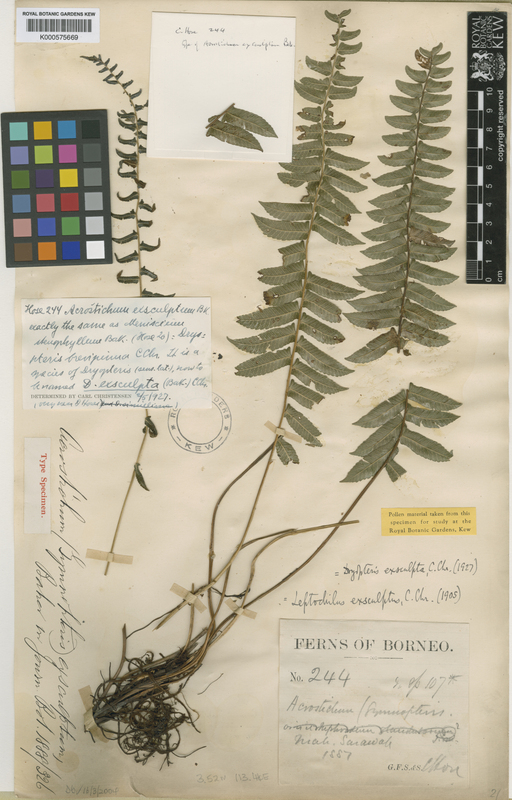 – Thelypteris exsculpta (Baker) K.Iwats., ActaPhytotax. Geobot. 21: 170. 1965; Tagawa & K.Iwats., Acta Phytotax. Geobot. 23: 175. 1969; Tagawa & K.Iwats., Fl. Thailand 3: 410. 1988. – Pronephrium exsculptum (Baker) Holttum, Blumea 20: 117. 1972; Holttum, Fl. Males., Ser. II, Pterid. 1: 528. 1982 [‘1981’]; Boonkerd & Pollawatn, Pterid. Thailand: 226. 2000. – Type: C.Hose 244, Sarawak, Niah (K [see http://www.kew.org/herbcatimg/249323.jpg]). 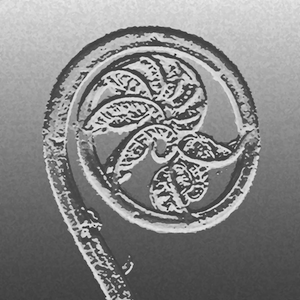 Pronephrium affine auct. non (Blume) C.Presl: Holttum, Blumea 20: 121. 1972; Holttum, Fl. Males., Ser. II, Pterid. 1: 527. 1982 [‘1981’]. Rhizome short, ascending; scales small, brown, hairy. Frond dimorphic, fertile frond taller. Stipes hairy throughout, up to 35 cm long in fertile and 17 cm in sterile ones. Laminae oblong to oblong-lanceolate, acute at apex, up to 15 by 4 cm in fertile, and 25 by 5 cm in sterile ones, without distinct terminal pinnae; sterile pinnae 7–25 pairs, gradually narrowing towards acute apex, distinctly auricled at acroscopic and broadly cuneate at basiscopic bases, shortly stalked or sessile, nearly entire, up to 7 by 1(–2) cm; chartaceous, deep green, verrucose below, venation meniscioid, areoles 2 or 3 rows; fertile pinnae narrower, up to 25 by 6 mm, with auricles at acroscopic base, shortly stalked. Sori round when young, indusiate, becoming confluent at maturity; indusia small, dark green, setose . On logs in streams at low altitudes. Data Deficient (DD). Known only from one locality in Thailand and in Borneo where its distribution and current status are unknown.